Today, we have a chance to check out Cooler Master's latest Hyper series CPU cooler, which is aiming at the budget and mainstream market segment. Cooler Master always had some impressive entry-level and well as mid-range cooler in their portfolio and the new Hyper series is to continue with this tradition. Today Cooler Master has released its newest member of the Hyper CPU cooler series, the Hyper 612v2, which is a quite an affordable CPU cooler that should be a much more capable than Intel and AMDs stock. Apparently cooling performance as well as noise level should be in completely a different league. 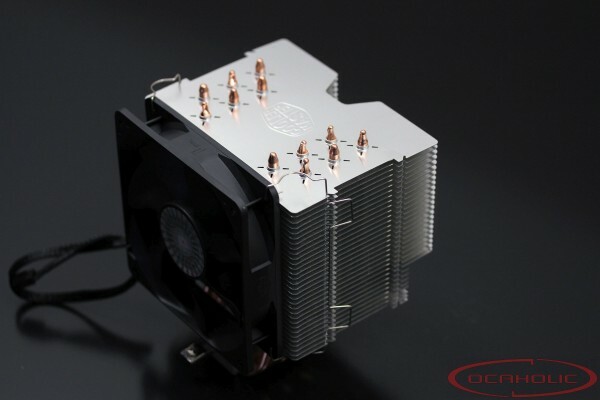 The Cooler Master Hyper 612v2 features a tower design with six 6mm heatpipes and a 120mm fan. The base as well as the heatsink of the Cooler Master Hyper 612v2 are both made from aluminum. There are no less than six 6mm copper heatpipes, which are in direct contact with the CPU. Cooler Master decided to equip this cooler with a 120x120x25mm PWM fan that comes pre-attached to the heatsink. In order to mount the cooler on the motherboard, you will actually have to remove the fan which is attached via simple but practical fan clips. They're actually quite heavy-duty, made out of plastic and quite hasslefree to plug and remove. The Cooler Master Hyper 612v2 ships in a rather simple box and it is well protected inside a foam mold. The rest of the components, or to be precise, the mounting mechanism comes in a separate small box. The bundle includes an installation manual, Cooler Master thermal paste, mounting components, and, of course, the cooler with pre-mounted fan. The warranty is set at two years which is quite standard for a product in this budget market segment.